Looking to invest into the top stocks? We help you pick the best. Vivekam runs an analysis of all traded stocks, and comes up with a list of growing top stocks. 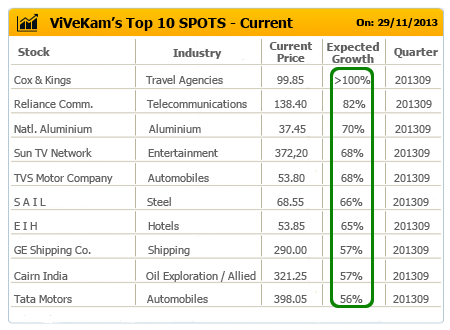 ViVeKam will provide the top 10 stocks picked based on ViVeKam’s ranking at that point of time. Based on the performance, underpriced stock with maximum scope to grow is determined and ranked accordingly. We also show the expected growth prospective for that stock thus making it easier for you to make your investment decision.